Bought these for my Husband who absolutely loves them! Says they've come in VERY handy! These are pretty cool and will be a nice gift for the guy who has most everything but likes gadgetry. From boy scout camp to the beach, these things work! Highly recommend! 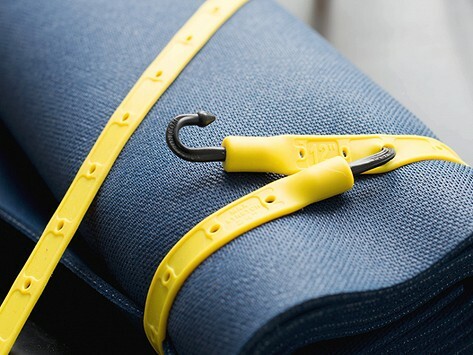 Well-constructed & well designed straps for convenience & organization. Love, love, love these utility straps. Besides being way more 'attractive' than a regular bungie, they can conform to the exact size you need as well. Great product!! Hold an umbrella over my lemon tree right now. Bought these as a gift. They are very attractive and well made. Anxious to see how they work. 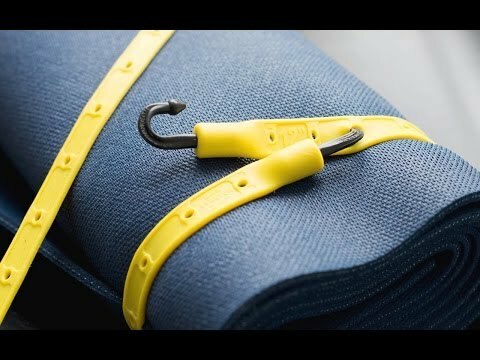 Anyone who’s ever tried to strap a mattress to the roof of a car or a sleeping bag to a backpack knows that it can often be easier said than done. That’s why avid outdoorsman and engineer, Courtney Ashliman, has come up with an innovative alternative to rubber bungee cords. Made of a proprietary silicone blend uniquely suited to hold your gear securely in place even in the most extreme temperatures, these waterproof, UV resistant utility straps are flat, not round, in order to minimize roll and maximize grip.